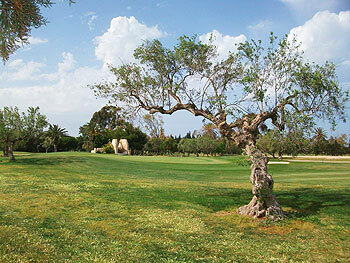 The 1970s marina and golf course development at Port El Kantaoui was a major project undertaken by the Tunisian government to attract tourists to the country. British designer Commander John Harris was called in to assist with the golfing aspects of the work and he brought in Peter Thomson, Michael Wolveridge and Ron Fream to help. When the initial 18 holes opened at El Kantaoui in 1980, Ron Fream was the only member of the design team left in Tunisia and he would go on to spend a large part of his time over the next 20 years laying out courses around the country, including another at this complex in the 1990s. El Kantaoui opened in a blaze of glory, holding the inaugural – but short lived – Tunisian Open in 1982. It consolidated its position as the leading course in the country during the 1980s before an additional 18 holes were laid out on the complex during the 1990s. The new course became the Panorama and the old course was named Sea. The Panorama is shorter than the Sea course and it lies more inland on hillier terrain. Elevated tees present golfers with fantastic panoramic views over the marina but concentration on the job in hand is vital, particularly on holes with sizeable water hazards. The short par four 17th is one such hole where, from a raised tee position, the fairways dog legs right round a lake to a green bunkered on both sides. I didn’t have enough time to actually play the Panorama course during my visit to the El Kantaoui complex but I saw enough on a tour round the 18 holes with one of the members to see that it’s easily the more challenging of the two layouts. The opening half dozen holes play out on lower lying land before a pair of very attractive par fours at holes 7 and 8 route the course up onto higher ground where much of the remaining action takes place – it’s never an easy task to make uphill holes look good but architect Ron Fream certainly succeeded with these two. I spoke to a group of Irish golfers – four of a party of fifty two who’ve been returning to this place for each of the last eight years – and they love the challenge offered by the tougher Panorama course. Truth be told, El Kantaoui’s a fine 36-hole facility which I’m sure sees many repeat visitors like those I met from Malahide GC.